Colorado Mesa’s offense should more or less be in line with last season’s, which was among the best in the nation with a .339 batting average and a .521 slugging percentage. If anything, their production could be even more potent. Jordan Stubbings deservingly was the Rocky Mountain Athletic Conference Freshman of the Year after he hit .382 with 11 doubles and 11 home runs in only 34 starts. Caleb Farmer, another newcomer to the team who batted .384 with 15 doubles, was honored with inclusion on the All-RMAC First Team as he split time between shortstop and third base. Also back in the mountains will be senior outfielder Hunter Douglas, who batted .409 and led the team in total bases, and Dominic DeMarco, who batted .327. Incoming freshman Haydn McGeary finished high school in the top five nationally in home runs and will likely start at first base. Scouts that saw him this fall compared him to a young Aaron Judge. The Mav’s pitching staff could either be super duper good or rather ordinary, most likely the former. JR McDermott went 9-1 with 108 strikeouts in 2017 and was an All-American as a freshman in 2016, but only made three starts last season due to injury. He’ll be back to lead this year’s rotation, which will be completely revamped with the loss of each hurler from last season who started at least five games. It is possible that three freshman could find their way into starting roles this season. Both Nathan Wilson and Andrew Morris looked good at Perfect Game events. Wilson performed so impressively in the fall that he earned an invite to pitch in the Cape Cod League next summer. Morris will likely start the season in the rotation and has a fastball which is steadily creeping towards the mid-90s. Jahred Butler also turned heads at Perfect Game events. He has a large, athletic frame and can effortlessly throw into the 90s. He initially was headed to Cal State Fullerton, but changed his mind and moved to Mesa. The Bobcats will be without much of last season’s lineup, but they make up in quality what they lost in quantity. Three All-American type players return in Wesley Wommack, Cal Gentry and Garrett Green. Wommack has been increasingly studly in a GC uniform, raising his batting average each season from .340 to .365 to .390 last year. In addition to his beaut of a batting average, he also added 15 doubles, three triples and four home runs. Gentry put up similar numbers, albeit with a less lofty batting average, but also added irreplaceable value as the club’s impenetrable shortstop. Green held down the hot corner and batted .375, a 75 point increase from this first two seasons on campus. Making up for some of the lost talent will be first baseman KC Brown. He is touted as being a slick-fielder who will yield a very good stick in the lineup. Coaches are also big on Jayson Cook, a dynamic player from Chattahoochee Valle Community College, where he batted .306 and stole 21 bases. Bradley Cammack was brilliant last spring appearing in 24 games in a dual role and accumulated 13 wins, five saves and 99 strikeouts in 85 innings. This season he is slated to appear exclusively as a starter and is penciled in to be the ‘Cats No. 1. Harrison Veldsma, who especially dazzled in April, will take over as the team’s No. 2. He stuck out 29 in 28 1/3 innings. Senior Logan Howard, who has appeared in 45 games over the past three seasons and compiled a handsome 3.66 ERA with 82 strikeouts in 73 2/3 innings, is another welcome holdover since last year. A couple of former D-I players will be joining the staff and looking to make an immediate impact after finding themselves in crowded bullpens last season: Bruce Bowen and Connor Darling, power pitchers from Clemson and Tennessee respectively. The Lakers’ lineup definitely took a hit over the summer, losing three of four everyday batters from last season who hit over .300. Nevertheless, ‘Hurst isn’t a club who looks to out-power opposition, instead relying on strong pitching and defense to put them past opponents. Matthew Schneider has been a welcome constant for the team the past two seasons. He’s been in starting lineup 91 times during that time, batting .310 with 13 home runs. Dom DeRenzo started off his college career with a bang, earning Freshman All-American honors as a catcher for Oklahoma, but his offensive numbers have sunk since then. Head coach Joe Spano is hoping the change in scenery will resurrect his swing. An offensive shot in the arm is also expected from Luke Baranchak, a transfer from Mercyhurst North East Junior College. He was named an All-American playing for the Saints after hitting .365 with nine doubles, seven triples with 27 stolen bases. His production could definitely lighten the load for the pitching staff. Mercyhurst has become a pitching factory that last couple of years, annually pumping out some of the best pitchers in college baseball. And that’s not just in D-II, but all of college baseball. The tradition continues with another wave of talented throwers which will make the Lakers competitive. The list begins with Russell Lamovec who started last season throwing 13 innings of no-hit ball and finished the year holding opposition to a .175 batting average and striking out 66 in 48 1/3 innings. His season was cut short as he didn’t have the opportunity to pitch past May 4 due to injury. Tyle Garbee is the other Laker with the most experience on the mound. In 71 1/3 innings he struck out 73 and earned a team-leading 2.52 ERA. Two other players to watch in particular include Adam Jeannette and Matthew Minnick. Jeannette was the team’s closer and induced almost every batter he faced to strike or ground out. Mincing started five games and only allowed 15 hits and nine walks in 24 innings. Additional support will come from Christian Young who had 106 strikeouts in 57 1/3 innings at Niagara Community College in 2017 and pitched in 17 games at West Virginia last year. Blaine Crim provides Mississippi College with a destructive presence in the middle of the lineup and the ability to break a game open with a single swing of the bat. Last season he was the straw that stirred the Choctaws’ drink, leading the team in batting at .383, home runs with 13 and RBI at 66. His success continued over the summer playing with the Southern Ohio Copperheads in the Great Lakes Summer Collegiate League. In one week in particular he went 14-for-28 with four doubles, three home runs and nine RBI. He is one of eight players back this season who started at least 25 games and accumulated 100 at-bats. Billy Cameron was second on the team in each of the triple-crown categories (.354-6-38) to give MC an enviable 1-2 punch. The team will also have back their starting shortstop, second baseman and catcher to provide stability and maturity for the defense. Chauncey Callier, a transfer from Lurleen B. Wallace Community College, is anticipated to give an additional boost to the offense. Like the offensive cohorts the pitching staff also returns two top starters along with an arsenal of supporting athletes. Chris Crosby started 16 games and threw 100 2/3 innings on the season with 96 strikeouts and a 4.11 ERA. He’ll be once again back by Zack Ingram who has made 26 starts over the past two seasons. Last year he lowered his ERA to 3.74, which was tops among Choctaw starters. MC also returns seven other players who saw time on the mound last season. Newcomers to the staff include Garrett Hollinghead, who also is from Lurleen B. Wallace Community College, and Brandon Nowak, who appeared in six games last season at LSU. The Cougars’ offense last season was especially dangerous because it was balanced with capable hitters up and down the lineup. Many of those same quality batsmen return to the roster to once again challenge Peach Belt pitching as the team completes for another trip to Cary. Robert Brooks and Chase Brown batted .337 and .321 respectively and Drew Webb started 58 games and stole 16 bases. Frank Wager was second on the team with 15 home runs to earn All-PBC Second Team honors. Joining them will be Kendal Ford, who played in 45 games at Georgia State last season, and Josh Dunson, who spent a pair of seasons at Alabama State. Kolton Ingram was the Peach Belt Conference’s top pitcher last season as he earned a 14-3 record with a dainty 2.18 ERA with 150 strikeouts. Rejoining him in the roster will be Tyler Cadenhead who started 11 games and had a 3.33 ERA. Sheridan Coy, who struck out 32 batters in 29 1/3 innings, and Jalen Latta, who fanned 42 in 39 1/3, give the team an established presence in the bullpen. The pair combined to appear in 45 games and had 3.68 and 3.43 ERAs respectively. The Mocs’ offense will not be as formidable as last season when they finished in the top 20 in scoring and home runs. Neither team MVP, Logan Browning, who hit .440, nor Hayden Marze, who powered a school-record 22 home runs, will be back this season. Also absent will be three other important players who had at least 200 at-bats last season. That isn’t to say that there isn’t a lack of talent headed back to Lakeland, far from it. Big 6-foot-6 slugger Jacob Teter batted .350 with 12 home runs as a freshman last season. Also returning is second baseman Dylan Costa, who hit .324 and was third on the team in hits, as well as senior Pablo Cabrera, who has started 151 games as the Moc’s shortstop and third baseman. Zach Diewert and Zach Scott, who started at Polk State, are among the transfers who are expected to have an immediate impact. Diewert set the school record in extra-base hits and Scott was on the All-Suncoast Conference teams the past two seasons. Like the offense, the pitching staff will be without its two most prominent performers, but still should be plenty formidable. Head coach Lance Niekro’s half-brother, J.J., who was second on the team with 16 starts, struck out 73 and had a 3.81 ERA, will be back. He has all-conference ability, as does closer Mike Palaez, who only allowed eight hits in 16 innings of relief last season. Cooper Bradford, who threw in 14 games for North Florida last season and fanned 53 in 51 2/3 innings as a freshman for the Ospreys, will be making the trip down I-95 to be the Mocs No. 1 starter this season. Zak Wilson, a transfer from Seminole State College,where he fanned 54 in 42 innings, will help hold down the bullpen. Mason Janvrin is an invaluable asset returning to the Mules’ lineup as he topped the team in batting with a .387 average. He also topped the Mid-America Intercollegiate Athletics Association with 92 hits and 32 stolen bases while earning conference honors with an MIAA Gold Glove. He’ll be playing for UCM again, as will four other everyday players who saw action in at least 50 games. Another major players back of note includes Erik Webb who had 36 extra-base hits with 20 doubles and 12 home runs and produced a .330/.429/.641 slash line. Sophomores Harrison Schnurbusch and Donovan Ditto provide solid defense in the middle infield as well as sneaky pop at the plate. Josh Schumacher from Kansas City Community College will help offensively and defensively in the outfield. He batted .387 with 18 stolen bases for the Blue Devils. The Mules’ pitching staff is also in excellent shape headed into the season. Luke Lucas led starters with a 3.96 ERA, 60 strikeouts, three complete games and a .248 opponents’ batting average. Ben Kelsch started 15 games and topped the Mules with 73 2/3 innings pitched as he earned a 6-1 record and 4.15 ERA. While both the aforementioned pitchers were solid on the mound they didn’t quite dominate. However, their anticipated closer, Luke Mercer, did. He struck out 28 batters in 23 innings and held opposition to a .238 average. It was quite the impressive jump in performance as his ERA was a thick 5.61 the previous year. Shae Stephens was injured last season and redshirted. If healthy he could find his way into the regular rotation. Eric Lindsay, who impressed out of the bullpen at Dodge City Community College, would work his way into the weekend mix as well. While it was the pitching that provided the edge to give Augustana the title last season, it is the offense that will power the team in 2019. The overwhelming bulk of the offense returns with only a pair of batters absent who accumulated 100 at-bats last spring. All the top Viking batters are back, including leadoff catalyst Riley Johnson, who led the team in hitting and stole 34 bases. Also returning are Jordan Barth, an invaluable vacuum cleaner at first base who is primed to have an off-the-charts season after batting .362 as the Vikings’ freshman cleanup hitter last season, and the ultra-athletic Sam Baier, a gold glove-winning shortstop who hit .310 with eight home runs and 29 stolen bases. As if that wasn’t enough top-shelf production returning, also back in the lineup will be .333-hitting steadfast catcher Lucas Wylie and Michael Svozil, who established a new school record with 41 stolen bases. Only one of five starting pitchers from last season’s team, which finished third in the nation in ERA, will be back this season. Among the missing will be Jacob Blank, who finished his college career with a 23-1 record and 222 strikeouts and was masterful in the championship finale. Thus, head coach Tim Huber will have a nearly group of starters taking to the mound this spring. Among the new wave of new arms will be home-state freshman Zabel Peyton, who was drafted in the 19th round, Connor Herd, a gradate transfer who pitched in 33 games at Mercer, and Seth Miller, another freshman who’ll also contribute at the plate. Michael Brandt, who was nearly unhittable the first half of the year when he struck out 34 in 19 innings while only allowing three runs and 10 hits, is slated to open the season in the bullpen. The Javelinas’ offense brings back five players who started at least 40 games to propel the team to Cary. Among the big bats headed back is Manny Loredo, who led the team with a .352 average and added 10 doubles and six home runs. Second baseman Kohl Ullman earned All-Lone Star Conference honorable mention after batting.328 with a team-leading 64 hits and 16 stolen bases. Head coach Jason Gonzales will be hoping that Pablo Hernandez reclaims his hitting stroke that propelled him to a .390 batting average in 2017 when he led the conference with 21 doubles. Alex Gonzalez hit a solid .286 while providing impenetrable defense at shortstop. Austin DeLeon, an outfielder from Panola College, is expected to hit for a high average and add speed to the lineup. Seth Spinn, a transfer from Temple College, is expected to make an impact as well after batting .331 last season for the Leopards. TAMKU’s top two pitchers will be back in action. Preston Plovanich has been a starter that past three seasons, earning 19 wins to date, but also has had an exponentially increasing ERA. Word on campus is that his numbers should come closer to his freshman year when he had a 3.11 ERA and stuck out 63. Tyler Flores was the LSC Freshman of the Year and Second Team All-LSC after compiling a 2.91 ERA in 65 innings pitched with 79 strikeouts. He also impressively held opposition to a .228 batting average and earned the win when the Javaelias shut out Mercyhurt at the D-II Baseball Championships. Taking over the third spot in the rotation will be Zach Boyett, a transfer from Weatherford College. Eric Sandoz, who came to TAMKU after Nebraska-Kearney shuttered their baseball program, is poised to take over the closer’s role after he had nine saves in 25 appearances and a 2.97 ERA for the Lopers last season. Cody Birdsong, Michael Nielsen and Chandler Purcell are returners who give the Hawks a solid core of experience. Birdsong may be D-II’s top second baseman as he hit .353 with 17 doubles and 14 home runs last year. Nielsen had double-digit home runs as well and batted .315 while Purcell hit .345 with only 13 strikeouts in 174 at-bats. Nolan Snyder, who was limited to 11 games due to injury, will also be back on the field. He hit .333 in 50 games as a sophomore in 2017. Cole Evans was a Missouri recruit out of high school and played outfield at top community college Iowa Western last season. He batted .354 for the Reivers, is a lauded physical specimen and will be an important fixture in the QU lineup. The Hawks will be sans the irreplaceable Brynn Martinez, but Ray Greco, who missed most of last season after starting his career at D-III UW-Stevens Point, should alleviate some of that pain. The Hawks lost little in regards to pitching and retained all four starters who started 10 games. Riley Martin and Nick Stroud give the team a formidable 1-2 punch. Martin had a 2.83 ERA in his 57 1/3 innings and Stroud struck out 82 batters in 57 1/3. Lance Logsdon had committed to Missouri after going 11-0 as a high school senior. However, after he underwent surgery to repair a partially torn labrum the Tigers backed out on their commitment to him. He’ll step in to take one of the remaining starting roles. Morehead State transfer John Hurayt can throw the ball very, very fast. If he is able to gain better control (he walked 12 in 9 innings at MSU) he could be scary good. Alex Pribyl was phenomenal out of the bullpen. He had a 1.71 ERA in 17 appearances, striking out 35 in only 21 innings. Only two batters from last year’s roster won’t be returning to the dugout and neither of them put up prolific numbers. That means Bill LeRoy, who led the team with a .331 batting average, Andres Perez, who hit 23 home runs and battled .330, as well as Conner Corbitt, who has batted .296 over the past two seasons with 22 home runs, will all be back in the lineup. Other important players returning to the everyday nine are infielders Chase Sudduth and William Mapes, who make up their solid middle infield. Neither put up big numbers at the plate but they’ll combine to save more runs than a more prolific hitter would generate. Cade Heil, Derrick Pickvet and Lyle Morrison started 40 of the UNG’s 53 games last season. While none of the trio were dominant each were quality hurlers who still have the ability to improve. Heil was only a freshman last season when he thew 97 innings, earned a 4.45 ERA (5.10 was the average in the Peach Belt so that’s much better than it looks) and only issued 15 walks. The resurrection of Steven Bower could be a monstrous boon for head coach Tom Cantrell. In 2017 he had a 2.14 ERA, held opposition to a .204 batting average and threw three complete games as the team’s ace. The Chaps return five players who started 49 games. Each of them batted at least .280 and three hit over .305. Andrew Pratt, who led the team with a .384 batting average and hit a conference co-leading 12 home runs, returns to spearhead the offense. He’ll be rejoined by Will Clark, who batted .314 with 13 doubles and 20 stolen bases, and Andres Negron, a fine fielding shortstop who batted .305 with six home runs. The already stalwart offense got even beefier with the additions of Hill Alexander, who hit .274 in 35 games at Dallas Baptist, and New Mexico Junior College’s Ryan Rijo, who had been selected by the Phillies after hitting .388 for NMJC while hammering 19 home runs. Three high quality proven starters return in Ricky Contreras, Ryan Johnson and Callan Johnson. Contreras went the distance in seven of his 13 starts, totaling 83 1/3 innings on the season. Ryan Johnson led the Chaps’ starters in ERA and stymied opposition to the tune of a .206 batting average. Callan Johnson limited opposition to a .223 batting average and topped the team in strikeouts. After excelling in the bullpen last season, Chandler Casey is slated to join the rotation. He had a 2.06 ERA in 18 appearances and amassed a splendid 46-to-8 strikeout-to-walk ratio. Each of the pitchers mentioned are seniors who’ll be looking to end their college careers in memorable fashion, and hopefully catch the eye of some scouts as well. The Mavericks should slug it out with Augustana in the Northern Sun Intercollegiate Conference as both team have an abundance of talent returning to their starting lineups. Teddy Peterson put up the most impressive numbers last spring batting .328 with a .416 on-base percentage. Not only is he a sparkplug in the lineup but Peterson is a brilliant performer at second base and an inspired leader in the clubhouse. Three other Mavs return who hit at least .314 in 100 at-bats. That includes the powerful Ty Buck, who was evaluated as the top player out of Minnesota coming out of high school, and Tyler Berg, who also was ranked as one of the North Star State’s top amateur prospects before initially playing baseball at the University of North Dakota. Jordan Hart has hit .346 his first three seasons playing under the guidance of head coach Mathew Magers and Ty Denzer will be looking to make an impact after joining the team following a pair of seasons at Kansas. Jon Ludwig has shown signs of dominance his first three seasons with the Mavs and is slated to close his college career as the team’s No. 1 starter. His time on the hill has been limited, but while on the bump he has struck out over a batter per inning and has held opposition to a .220 batting average through his first three years. Trevor Divinski and Bobby Gauvreau are two other holdovers who should contribute substantially this season. Divinksi will likely be the No. 2 starter, and Gauvreau, who has a silly mustache in his team profile picture, has been a force out of the bullpen after starting his college career at Georgia State. Jack Zigan, a transfer from Cal Poly, has returned to his home state and should earn a number of innings as well. Alex Eliopulos is one of D-II’s most entrenched players headed in the season. He’s started 76 consecutive games at third base for the Tritons and is the second-leading returner nationally in RBI after knocking in 72 last season, many of which came courtesy of his 14 home runs. Nick Kitzmann provides experience behind the plate as well as being UCSD’s top slugger. He hit eight home runs last season in only 115 at-bats. Also rejoining the team at an important defensive position is Shay Whitcomb who made 59 starts at shortstop as a freshman. He reached base in each of his first 31 collegiate games and finished the year with a .310 batting average. Tyler Leskiw, who hit .328 down the road at San Diego Mesa College and earned All-Pacific Coast Athletic Conference First Team honors, will join the outfield. The pitching prowess will once again be high with the duo of Preston Mott and Cameron Leonard starting things off. Mott had the best numbers last season as he earned the win in eight games for the second straight season. He also lowered his ERA to 3.25 and struck out 88 batters in 83 innings. Leonard impressed as a freshman in relief, earning a 3.10 ERA in 29 innings. Brandon Weed, a transfer from Southwestern College, will likely enter the rotation after throwing 78 innings with a 3.12 ERA. Luke Mattson should see a fair share of starts as well. He led Golden West Community College in strikeouts and had a 3.13 ERA for the Rustlers. The biggest bats from last year’s team graduated but there still is a wealth of players still on the roster to power NSU this season. Samual Duran is the leading hitter back. He batted .384 last season with 22 extra-base hits and 13 stolen bases. Rejoining him in the outfield will be Nathan Chevalier, who hit .312. Between the two of them baseballs will have much difficulty finding green in the outfield as both are defensive beasts. Third baseman Ian Acevado is another important player back on the diamond. In addition to playing solid defense he batted .297 with 14 stolen bases. Brandon Chinea played in 43 games at Tennessee, where he struggled at the plate, but his defense made him an asset. Coaches believe the change in scenery will allow him to harness the speed and power that was lacking in Knoxville. Another player hoping to have a baseball renaissance in Ft. Lauderdale is Garrett Wolforth. He was First Team All Missouri Valley Conference and on the MVC All Defense Team as a catcher at Dallas Baptist in 2017. In three years with the Pats he hit .263 with last year being the lowest of the three. Big, big, big things are expected from Brock Minich out of the bullpen who admittedly was hit-and-miss (mostly miss) last season as he gave up 16 hits in 6 2/3 innings. Over the summer, however, he honed his closer skills with the Forest City Owls of the Coastal Plain League as he stuck out a batter per innings in 17 appearances. Another player who is returning but didn’t exactly light up the boxscore is Jarret Krzyzanowski. He appeared in 12 games last season but is expected to be as hard to hit as his name is to spell. He is penciled in to be the team’s No. 2 starter. Matthew Ornelas, a standout form Sacramento City College, is slated to be the No. 1 man in the rotation. He has a high swing-and-miss rate as evident by his 85 K’s in 100 innings pitching for the Panthers. Another new name to the rotation is Nathan Campbell. Although he is only a freshman, he’s earned high praise for his poise on the mound and was one of the highest rated Florida lefties coming out of high school. JP Williams from Eastern Florida State is expected to eat up innings in the middle of games. MatthewJones was an All-Gulf South Conference First Team shortstop selection last season, finishing the year with a .351 average, team-leading eight home runs and a .948 fielding percentage anchoring the infield. Matt Estrada, the GSC Freshman of the Year, was second on the team in hitting and finished at .347. Additional critical output should come from Matt Sullivan, who hit .335 and led the team in doubles, and Bryant Harris Jr., who batted over .300 in 30 games. Three transfers who should see valuable playing time are Dylan Menhennett from Mississippi Gulf Coast Community College, Isaac Phillips, from Chattahoochee Valley Community College and Mike Farnell, a transfer from Murray State, who will bring a powerful lefthanded bat in the lineup. Dylan Mills-Derouen was a top-shelf starter last season striking out 69 batters in 55 2/3 innings. However, he is scheduled to be the team’s closer this year. That makes way for incoming athletic Appalachian Statetransfer Andrew Vaccacio, to take over the ace role. Coaches don’t doubt that he has draft potential as he had 80 strikeouts and 73 innings for the Mountaineers. Following him in the rotation will be Tony Kucera who started 13 games last year, earning a 3.00 ERA while throwing three complete games and 78 innings. Lucas Hunter, who started six games last season, brings additional experience to the staff, as will Jared Middleton, who lead the tam in ERA in 2017 and had a 2.63 mark over his final five outings last season. Daniel Floyd, a JUCO transfer from Wallace Dothan, will work his way into the staff as well based on his strong consistency in the zone with several pitches. The Penmen don’t return much on offense, but that’s not a big deal because SNHU isn’t a team that traditionally pummels opposing pitchers. Instead they just need a lineup capable of scoring just enough runs for their stingy pitching staff to earn the win – that and a solid defense that makes opponents earn what they get. Of course, anything above and beyond when it comes to creating havoc in the batter’s box helps and that’s Tom Blandini excels at. He led the team in batting last season at .325 with 13 doubles, 10 triples and a pair of home runs. He’ll be back in uniform along with Joshua Goldstein, the team’s breakout second baseman who only had four errors for a .972 fielding percentage and a team-leading.488 on base percentage (thanks in large part to being on a painful end of 19 HBPs). Dylan Faircloth, a JUCO transfer from North Lake College in Texas, will join the team and bat in the middle of the lineup. Despite losing his top three starters from last season who K’d 287 in 252 innings and helped the team to a fourth-in-the-nation 3.05 ERA, head coach Scott Loiseau believes that this year’s rotation has a shot to be better than last spring’s. Jake Walkinshaw and Endy Morales have been tabbed as the top two starters headed into the new season. Walkinshaw had a 1.64 ERA in a dual role and Morales struck out 42 in 34 innings. Also factoring into the rotation will be Wesley Tobin, who was in the bullpen last season. In 18 games Tobin fanned 41 in 37 2/3 while only allowing 27 hits and 10 walks. Brian Eddy or Chris Murphy, transfers from Indiana State and Maine respectively, are the most noteworthy pitching newcomers who could have an immediate impact as a midweek starter or doing back-end work. The Buffs offense was stringent last season, finishing second nationally in batting average and in the top 10 in doubles, on base percentage, slugging percentage and scoring. Those numbers will not be replicated this spring as the bulk of talented top hitters from last year’s team graduated. With that a new crop of WT hitters will need to be cultivated if the Buffs are going to score big. The seeds will be planted by Tag Baxter, an All-American type catcher who led the team in batting with a .362 average. Christian Loya, a utility player who has hit a combined .326, could be a force if he is able to remain healthy. Aside from that pair, the best numbers at the plate will likely come from transfers. Clay Koelzer was a MLB prospect and a top D-I recruit coming out of high school but things didn’t quite click for him at Texas Tech. Another catcher from a big time D-I program headed to WT is Kyle Kaufman from Alabama. While his stats didn’t drop jaws last season he was second on the Tide in batting in 2017. Keone Givens, another athlete who stated his career at Oklahoma before playing at Butler Community College, has also joined the club. He batted .311 and stole 40 bases. What will keep the Buffs competitive this season is their pitching. Joe Corbett returns to the mound after earning First Team All Lone Star Conference honors after leading the team with 100 strikeouts and 97 1/3 innings with a 3.05 ERA. Also returning is Darin Cook, a fellow All LSC First Teamer who struck out 86 in 79 innings. Former Clemson pitcher Mitchell Miller, who had been named the No. 15 ACC prospect by Perfect Game, will join them on the staff. He will welcome the opportunity to show why he was drafted last spring despite only throwing two innings for the Tigers. Baden Baker and Dominic Yearego, who each excelled in bullpen roles last season and earned a half dozen saves apiece, will also be back. Baker only allowed three of 27 inherited runners to score and Yearego struck out 33 in 28 1/3 while only issuing five walks. Last year’s Stars offense was powered by a wealth of senior talent who ended their college careers by powering the Prairie Stars to the best season in school history. Consequently that same group played their last out of college ball when the team was eliminated in regional play. From a team that launched 118 home runs last season the handful of player who remain only accounted for 34 of those blasts. Cole Taylor and John Sechen are the only players back who started at least half of the games in the field last spring. Each of them are dandy producers. Sechen hit .363 with 19 extra-base hits and 16 stolen bases (he also uniquely split time between center field and catcher) and Taylor hit .351 while topping the team in extra-base hits with 40 (24/2/14). Nick Wisz, a big, powerful hitter who played at Parkland College, will help a bit as the offense revamps, as will Ruban Markham, a second baseman from LA Harbor Community College. Despite the uncertainty on offense, the Stars will remain in national contention this year due to their pitching staff. They return 420 of 460 innings pitched from last year’s team that was top 10 in ERA, strikeouts per nine innings and WHIP. Andrew Dean and Justin Revels will once again be the top pitchers after going a combined 18-2 last season with a 2.87 and 2.99 ERA, respectively. Dean threw four complete games while Revels topped the team with 108 strikeouts. The rest of the staff ain’t no slouches either. Brayden Jensen has been in the rotation the last two seasons and Gunnar Kay struck out 32 batters in 31 1/3 innings. Brock Immke, who was USI’s top starter two falls ago before having Tommy John surgery, will also compete for a starting job. The Stars’ bullpen and closer specialist options are too numerous to list as head coach Christophe Ramirez has a number of quality arms to turn to in the late innings. The offense was one of the Pacers’ strong suits last season but many of the top performers graduated. While the remaining players won’t murder the ball they are more than adequate enough to rack up runs. Joey Smithers becomes one of the most important players on the club after being limited to a backup and defense role his first two seasons with the team. He started all 54 games last season, posting a .296 batting average with 14 doubles. Phillip Watcher was a two-year starter at The Citadel before joining the Pacers last year. He is adequate with the bat but very solid defensively at second base. Connor Durden is the most prolific offensive threat back in the lineup. He batted .307 last season and hit 11 home runs. Luke Leisenring, who played in 20 games for Arizona State last season, will be a presence in the lineup and behind the plate. Mitch Spence, who only saw action 16 2/3 innings in a relief role in 2017, emerged to be a bona fide force on the mound last season. He struck out a team-high 117 batters and held opposition to a feeble .203 batting average. During the season he earned Peach Belt Pitcher of the Week twice. If it weren’t for Spence, Zach Rafuse would be a legitimate ace for the Pacers. He made 14 starts, throwing 84 2/3 innings with 85 strikeouts and a 3.51 ERA. Daniel Wiggins compiled 42 innings and five saves out of the bullpen last season. He’d be slated to be the team’s closer once again but Henry Cartrett, who only saw action in three games last season, is first in line to take over that role. The Lions will have five players who started at least 40 games back in the everyday lineup punctuated by the return of Peyton Isaacson, one of the most dynamic players in D-II baseball. Isaacson not only topped the team in the trio of slash line statistics (.346/.436/.632), as he hit 12 home runs and 17 doubles, but he also appeared in 21 games on the mound and tied the team record with 14 saves. Also returning are three other players who got a hit every third at bat: Brett Coffell (.333), Amir Wright (.335) and Jared Morello (.345). Derek Gibree, who has started 145 games for the gold and green, is a brilliant defensive shortstop and above average hitter. Joining the lineup will be outfielder Jacob Reimold, who batted .320 in 100 games the past two seasons at West Virginia Tech. Pitching proficiency is a big question mark for the Lions. They could be dangerously good or extremely lackluster. Joey Antonopoulos is a tall 6-foot-5 drink of water who came to Leo from Saint Joseph College along with head coach Richard O’Dette (as did Amir Wright). He looked very good at times last season striking out nearly a batter per inning during the regular season as well as over the summer with the Holly Springs Salamanders. Shane Haight had a 3.68 ERA for the season with 63 2/3 innings with 11 starts and is penciled in to be the No. 2 starter. There is much optimism for a big year from Mccabe Sargent, a versatile sophomore athlete who is a work in progress. Sargent pitched two no-hitters during his senior high school season and was also a more-than-capable hitter. His stats didn’t impress last season but he has a high ceiling and could be an invaluable asset on the mound. There is also the aforementioned Isaacson who will be back to hold down the bullpen. 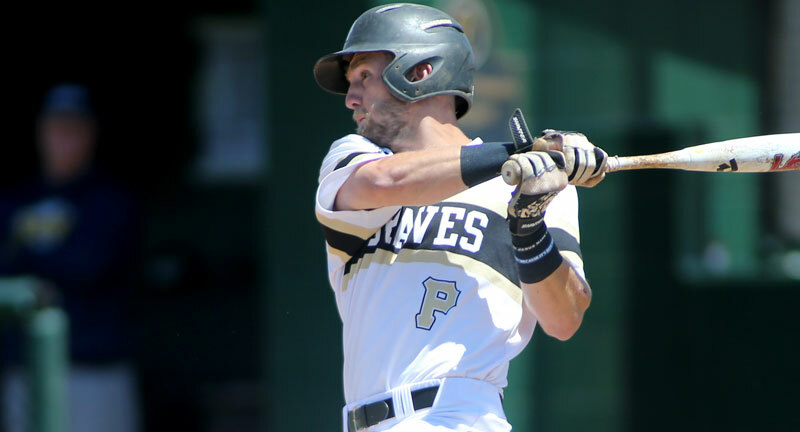 The Huskies are a dark horse team to come out of the always-competitive PSAC, however, they will be without Austin Edgette, who inarguably was their top hitter and most dangerous offensive weapon last spring. Pretty much the rest of the upstart roster remains which should make Bloomsburg a team to watch. Seven remaining everyday players batted a combined .293, a solid number for a club in the PSAC. Cole Swiger, who hit .339 with 17 doubles and 13 stolen bases, takes the reins as the Huskies’ primary offensive threat. Individually no player stands above the others as far as a long ball threat, but there is pop spread throughout the lineup. Nate Krizan plays a mean shortstop and adds to the offense with a potent bat as well. Last season he raised his average from .231 to .291. Carter Chasanov, a redshirt freshman who originally signed with conference rival East Stroudsburg, will add depth and speed to the lineup and could be the team’s leadoff hitter and center fielder. The pitching staff doesn’t dazzle but they do get outs. Coaches are putting stock in a big year by Ashton Raines who emerged as a legit No. 1 last season. He threw six complete games in 2017, but gave up a lot of hits in the process. Last season he lowered his WHIP considerably and continued his tradition of issuing few free passes. Like Raines, neither Nick Stoner nor Chad Cooperman overwhelmed opposition, but they were effective. Both struck out more than a batter per inning while Stoner additionally held opposition to a .196 batting average. Trey Hinkle, who led the team in appearances and saves and was second to only Stoner in WHIP, will be back to anchor the bullpen.